Florida is home to more condominiums, HOAs, licensed managers (CAMs), Statutes, and Boards of Directors than any other state in the US. The billions of dollars that flow into the industry by way of assessments, fees, dues, etc. and then paid out in the way of purchased services and operating expenses confirms the need for highly trained Managers who have the tools and ability to navigate the complicated waters. Community Association Managers are the integral part of the leadership of the community and the industry. The thousands of Florida licensed managers that are dedicated to their communities and management companies are the professional leaders with their “feet on the ground.” Managers are tasked with adapting to a constantly changing environment that affects both the financial and esoteric culture in their community. FCAP Is Here to Help! FCAP recognizes that Florida’s licensing process and continuing education requirements provide a limited solution, and are lacking in fully meeting the needs of professional managers to fundamentally facilitate, meet, and/or exceed the association’s expectations. FCAP, through its Certified Florida Community Association Manager program, has developed a course of study that is designed to meet that need, while offering flexibility in both time and budget. Florida Community Association Professionals (FCAP) is the only statewide member organization dedicated to serving the educational needs of those in the community association industry. The mission of FCAP is to train and equip Florida’s community association professionals by providing the most thorough and up-to-date educational materials from the most knowledgeable sources. Membership is open to managers, service providers, and community leaders. Advanced certification and continuing education credits are available for CAMs, while other members are able to audit selected courses. Full Statewide Participation: FCAP has membership in every region of Florida. It is not a local organization. Florida-focused: All FCAP training, whether CEU or Advanced CAM Studies, is specific to Florida and the laws of Florida. Florida is unique in its requirements for managers and the complexity of the managers’ job. Training on a national level has very little application to the ever-changing laws and culture of Florida. Manager focused: FCAP is primarily a managers’ organization with CEU training specific to their requirements and needs. FCAP offers the only exclusive online catalogue with more than 100 hours of available courses. Service Provider Participation: Service providers are essential to the administration, maintenance, and efficient operation of Florida’s community associations. These FCAP members bring their years of training and experience to the table and make that problem-solving information available to other FCAP members through curriculum for both CEUs and advanced training. 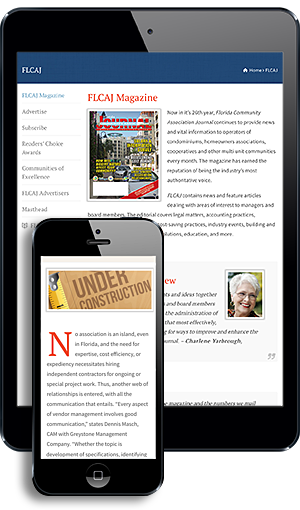 Magazine Support: FLCAJ is the only monthly statewide publication serving the community association industry. Now in its 31st year of publication, the magazine continues to be indispensible to managers and board members alike. CondoJobs Support: Members have the support of the oldest and most trusted statewide manager job referral program. FCAP offers the only Florida-specific professional designation in the industry. The core of the certification is the Florida Advanced CAM Studies (FACS), the most comprehensive, systematic training program available for community association managers. Developed with the help of more than 140 Florida professional service providers, educators, and managers, the eight modules containing 38 chapters with approximately 175 study resources cover virtually every aspect of community association management. To earn the designation, a candidate is required to answer approximately 800 multiple-choice questions, distributed throughout the curriculum at the end of each resource. For those in the community association industry in Florida, this is considered the “Master’s Degree” in Florida Community Association Management! FCAP understands the time demands placed on working managers. For that reason, the FACS online classes are divided into eight modules, which can be taken individually as time allows. The only time requirement is that all modules and tests must be completed within 12 months of starting. Modules are paid for as they are opened, which makes budgeting easy to manage. FCAP currently offers more than 50 online continuing education courses free for FCAP members. These courses are available 24 hours a day. The course materials are provided by the top professionals in the industry and updated frequently. CEUs are available in all categories as well as the required legal update. The Florida Advanced CAM Studies (FACS) is unique in its approach to educating managers. Through it you will gain the knowledge required for success in managing today’s community associations. Get started with your FACS today!